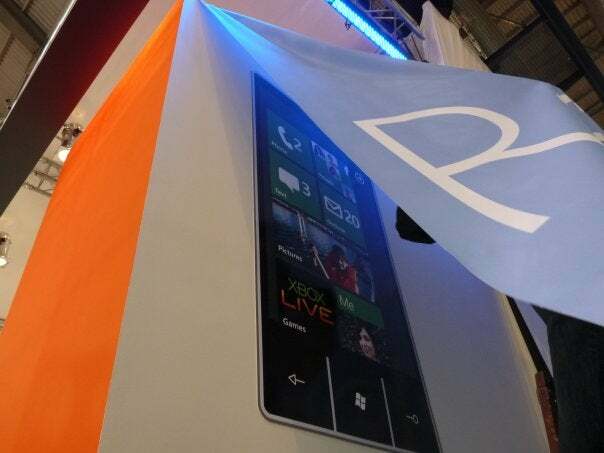 Supposed images of Windows Mobile 7 have been posted to Facebook for the entire world to see just hours before Microsoft CEO Steve Ballmer is expected to unveil the mobile OS at the Mobile World Congress in Barcelona. 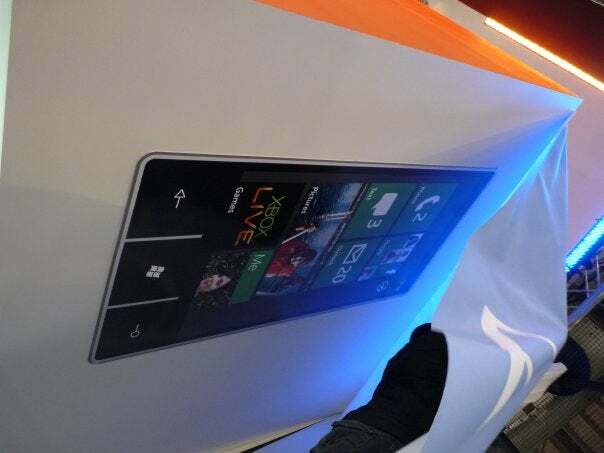 The images come from the German-based mobile blog Learnbemobile, and show what looks like a backdrop for Ballmer's talk featuring what may or may not be the home screen for WinMo 7. The images are particularly tantalizing, because they show a MWC worker lifting a cover off the backdrop long enough for a sneaky photographer to get a few shots. 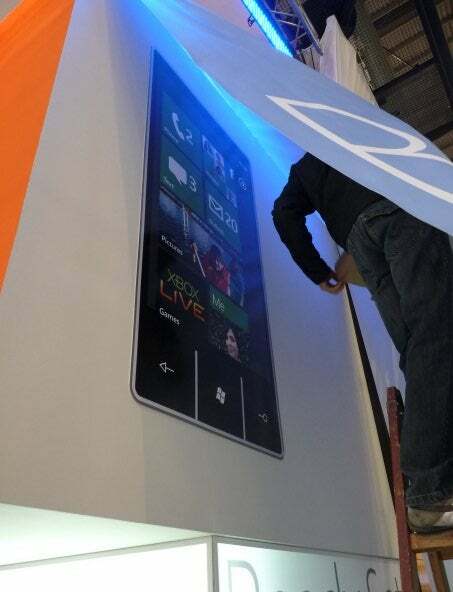 The images also back up the assumption that WinMo 7 will have a Zune-like interface that includes Xbox LIVE integration. There are seven different sections on the home screen, but the images aren't high enough resolution to tell for sure what each section is. At the top you have four green square icons called Phone, Text, Outlook and, in the top right, what looks like some sort of social networking. Best guess is the social networking icon is for Facebook, but there have been suggestions of a Microsoft specific social platform as well. Below those four squares there appears to be one broad banner called Pictures, and underneath that is a square that's clearly marked Xbox LIVE and another one called "Me." The image also appears to frame the WinMo 7 interface within a mobile device. My guess is that Ballmer may also reveal a specific piece of hardware that will be the first device to run WinMo 7--similar to what Google did with Android 2.0 and Droid followed by Android 2.1 and Nexus One. The purported WinMo 7device looks like it has three physical buttons: a back arrow, the Windows logo and a magnifying glass. Question: Why is there what looks to be a social networking icon at the top corner and then a "Me" button in the bottom right? Best Guess: The top right will be Facebook or some kind of Digsby-style social networking aggregator. The "Me" button could be connected to your Windows Live profile including Microsoft products like Hotmail, Skydrive, Calendar, Office Live and so on. Question: Will the "Text" icon include all forms of messaging including SMS, MMS, and possibly voicemail? Best Guess: It will probably be for SMS and MMS only. Question: What's up with the Pictures icon? Best Guess: Other than the obvious, I think the pictures icon may include not only photos saved on your device, but also a link to your photos stored on Windows Live Photos and possibly Flickr. Question: What will the Xbox LIVE features be? Best Guess: I just can't make a guess here. Most rumors are pointing to the basics like Gamertags, managing your account, seeing who's online, check gamerscores and so on. But there was that ad last year on Microsoft's job board that said Microsoft needed people to help bring "Xbox LIVE enabled games to Windows Mobile." Question: Will there be hardware introduced today? Best Guess: Almost certainly. When Ballmer introduced Windows 7 on tablet devices, he used an HP tablet prototype. I would expect, at the very least, to be a see a prototype of a WinMo 7 device. But I would put my money on a Ballmer showing off a market-ready device. So what do you think? Are these photos the real thing? If it's genuine, will you be buying a WinMo 7 (or whatever the official name will be) device? Microsoft CEO Steve Ballmer's keynote address begins at 9 AM ET from Barcelona. Be sure to follow PC World for all the hottest news coming out of Mobile World Congress.